There are lots of ways you can use a coin-apillar. 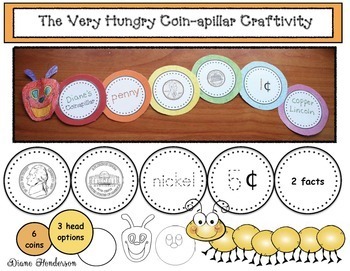 Make masters of each coin’s “segments”, laminate, trim and glue together to make 6 coin-filled caterpillars. Hang them up as a fresh, spring bulletin board, or use the coin-apillars as an anchor chart border. Make extra coin-apillars, but don’t glue the body-segment circles together. Put Velcro dots or magnet buttons on the back, so you can play the whole-group game, “build a coin-apillar"
Pass the coin body segments out to your students. Call for a coin. The children holding those coin circles show them, then build that coin-apillar by fastening the circles to your flannel or white board, behind the caterpillar’s head. Make an extra set and use as puzzles for an independent math center activity. Children can also play Memory Match or "I Have; Who Has?" games with the caterpillar's segment "body" circles. Finally, assign coins, or give children a choice and have them make their own coin-apillar. Afterwards, have them use their coin-pillar for some measurement activities. I added an extra blank circle to the end of my coin-apillar, so my students could write 1-3 things associated with that coin, such as the color, who’s on the coin etc. Caption: "Caterpillars Make Cents!" or "Making 'Cents' of Money With The Very Hungry Caterpillar". I’ve also included four, “What’s this caterpillar worth?” worksheets. Click here, to see more Money activities.